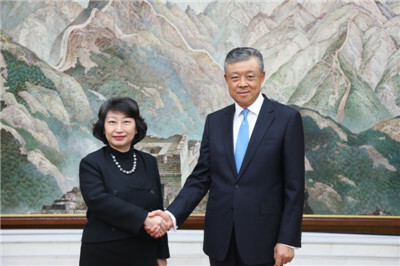 On June 13, Ambassador Liu Xiaoming met with Cheng Yuek-wah, Secretary for Justice of Hong Kong SAR Government, and her delegation at the Chinese Embassy. Ambassador Liu noted that since Hong Kong’s return to China, “One Country, Two Systems” has achieved great success, with huge achievements in rule of law. Rule of law is one of the core values of Hong Kong society and the foundation of prosperity and stability in Hong Kong and better life for its people. Recently, however, the attempt of a handful of people to deny and challenge China’s Constitution and the Basic Law of Hong Kong Special Administration Region has trampled on Hong Kong’s laws and caused chaos and adverse consequences in Hong Kong and negative impact internationally. At the same time, some countries attempted to interfere in Hong Kong’s affair under the pretext of “rule of law”. The Ambassador hoped that Secretary Cheng and her colleagues from the Department of Justice would share the success stories of “One Country, Two Systems” and the achievements of Hong Kong in rule of law with the UK side, especially with the political and legal circles, which would enable the British people to better understand China’s policies related to Hong Kong and the development of rule of law in Hong Kong, so as to safeguard rule of law and maintain the stability in Hong Kong. The Ambassador pointed out that China-UK “Golden Era” has been accelerating, with fruitful cooperation in all fields, and Hong Kong has played an important role as a bridge and a bond for China-UK relations. 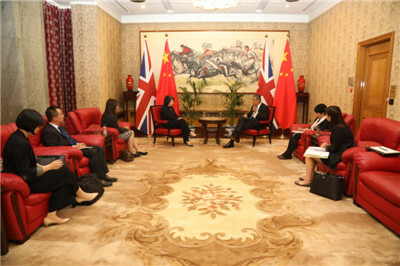 He hoped that Hong Kong could give full play to its own strengths in finance and legal fields and seize the opportunities of the Belt and Road Initiative and the construction of Guangdong-Hong Kong-Macao Big Bay Area to accelerate its development and continue to contribute to China-UK “Golden Era”. Secretary Cheng said that with the full support of the Central Government, Hong Kong SAR Government has been advancing its various undertakings steadily, achieving remarkable results in rule of law, and laying a solid foundation for Hong Kong’s prosperity and stability. According to the World Bank, Hong Kong’s world ranking in rule of law leaped from below 60 in 1996 to the 16th place in 2017. The World Economic Forum report ranked Hong Kong top in judicial independence of all common law practicing Asian economies. She would show Hong Kong’s progress in rule of law to the British society. Looking into the future, Hong Kong stands ready to participate in the Belt and Road Initiative and the construction of Guangdong-Hong Kong-Macao Big Bay Area to contribute to the development of the motherland and China-UK “Golden Era”.